Sixteen months before a 27-year-old Tampa General Hospital intern turned left with her SUV at a south Tampa intersection on July 29 and mortally wounded a 75-year-old bicyclist who was pedaling through the crosswalk, SWFBUD sounded the alarm about bicyclist fatalities in Tampa Bay and Florida. Federal stats showed Florida had the most bicyclist fatalies in the U.S. in 2007 and bicyclists are killed at such a high rate in Florida that their deaths on the roads usually mean only a few paragraphs in the local newspaper. SWFBUD asked everyone from Tampa city officials to transportation planners to launch a public awareness campaign to alert drivers of motorized vehicles that bicycles are vehicles and that cars, trucks and buses need to pass bicyclists by a space of at least three feet in compliance with state law. But this 75-year-old bicyclist killed in the early morning in late July was no ordinary bike rider. LeRoy Collins was a retired Navy admiral who was the executive director of the Florida Department of Veterans' Affairs and the son of a former Florida governor. 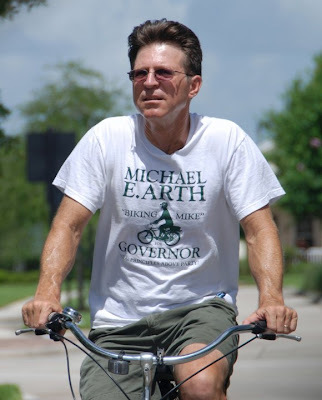 He was the also the dad of my Seminole Heights bicycle friend, Ed Collins. A few years ago I told Gena Torres, who works as a local MPO transportation planner in Hillsborough County, that the public will only pay attention to bicyclist deaths when someone who is prominent dies on a bicycle. Which is why a local newspaper published a story on bicycling safety this week when ordinarily they run a short brief story when a bicyclist dies. Even before Mr. Collins tragically lost his life while riding a bicycle, SWFBUD had recently partnered with local police agencies and the HART public bus service to display signs advising motorists to pass cyclists with a berth of at least three feet and respect a bicyclist's right to be on the road. Apparently. a hospital intern by the name of Margaux Manuel hasn't seen those bike-safety messages. She turned left with her SUV at an intersection at Brorein Street and South Hyde Park Avenue and T-boned Mr. Collins. As a result, another Florida bicyclist was dead. Tampa might be a big city, but it's also small enough that everyone seems to be connected to each other. So small, in fact, that Mr. Collins' son, Ed, was formely married to a woman who was friends with the driver of the vehicle that killed his dad. I spoke with Ed Friday afternoon and I can assure you that Ed does not want vengeance against Ms. Manuel the driver. But Ed does want justice. Which is why Ed told me that he could not understand why Tampa police did not cite Ms. Margaux for driving a vehicle that struck his dad. Police did report that the driver was making a left turn when her vehicle struck the bicyclist. When I read that I thought to myself that surely police would at least cite the driver for careless driving or failing to yield a right of way. Ed does not want Ms. Manuel to suffer just because he suffered the loss of his father. But surely, Ed told me, shouldn't the driver be cited for something? After all, a bicyclist was struck by a vehicle while crossing an intersection and died. Tampa is a city that is not kind to bicyclists. Mayor Pam Iorio claims she supports bicycling, but she recently killed a city transportation manager's plan to stripe bike lanes on a 2.2-mile stretch of Euclid Avenue. Why? Apparently our so-called pro-bicycle mayor thought the convenience of people who wanted to park on Euclid was of more importance than the safety of bicyclists who pedal along Euclid. There is a culture in Tampa city government that talks about helping bicyclists and actually does very little in the way of on-road infrastructure for bicyclists. Thank goodness the Florida state Department of Transportation -- not the city -- striped bike lanes on Nebraska Avenue and Tampa Street. Like Tampa, other Florida cities such as Miami and St. Petersburg had horrific reputations for being unfriendly to bicyclists. But immediate former mayors decided to apply resources to make their cities' more hospitable to bicyclists. Now St. Pete and Miami are seen as model turn-around bike cities. Even non-traditional bike cities such as Boston and Long Beach have launched bicycle programs to stripe bike lanes. Mayor Iorio? She TOOK AWAY bike lanes on Euclid ao that people can park for book club meetings. We need a city mayor who will support bicycling like she does light rail and the arts. We need our public officials to rally support to educate drivers about bicyclist safety in the same way they did to fight drunk driving and get people to wear seat belts. Perhaps if Ms. Manuel was informed by bike-safety PSAs and public awareness messages to look out for bicyclists, Ed would still have his dad around to talk bicycling. I was deeply saddened this morning to hear that the father of my bicycle friend Ed Collins was killed while biking this morning in Hyde Park just before 7 am. LeRoy Collins, Ed's dad, was 75 years old, a retired admiral and was the son of a former Florida governor. The crash was at Brorein Street and Hyde Park Avenue. A man died and all the TBO story could offer is that the crash snarled traffic. Ed is a big cyclist who lives in Seminole Heights and my condolences to Ed and his family. The St. Pete Times offered this story. And here's the TBO story. Don't forget -- SWFBUD bike shop Carrollwood Bicycle Emporium is having its final stage of the second annual Tour de CBE Sunday at 7:30 AM. CBE will have 27- and 42-mile ride options, both bringing you back to the shop to watch the Tour de France riders roll into Paris. Enjoy some great food and drinks at the shop when you return from the ride. $100 Reward for your information/help that results in the recovery of a stolen road bicycle at 3:30 PM Saturday July 17 from the Jan Platt Regional Library at 3910 S. Manhattan Ave., south Tampa (just a mile north of Gandy Blvd). This is a distinctive and unique-looking road bike. See picture below but there are a few changes (I don't have a picture of the actual bike because it was on the road for less than a week). White aluminum frame with Ridley brand name, carbon fork. Red markings. Triangular-shaped tubing. Bontrager rear wheel. Bontrager tires. And a Zefal XP3 pump on frame. I'm happy to say HART will be a sponsor of the 2010 Bicycle Bash Classic, Presented by Cure on Wheels. 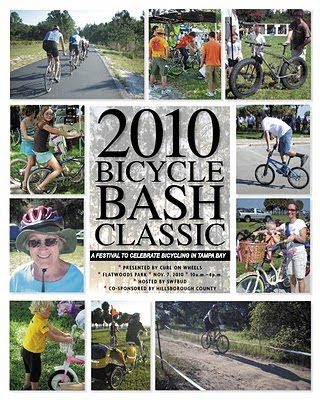 The Bash is Nov. 7 at Flatwoods Park off Morris Bridge Road and Bruce B. Downs. My good friend Mariella Smith from south Hillsborough County is leading the charge to get the Hillsborough County MPO to include all six segments of the South Coast Greenway in its 2035 Long Range funding list. Circle the date -- Aug. 3 -- and attend an MPO public hearing to speak up for the South Coast Greenway. 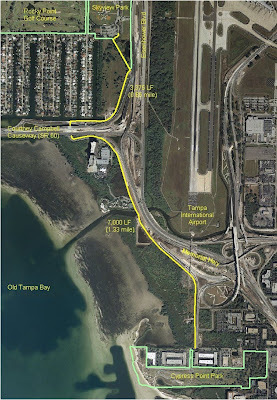 Much attention has been given to attaching the Upper Tampa Bay Trail with the Suncoast Trail in Hillsborough, but south county trail projects are often overlooked. Mariella explains how to get involved. The south coast greenway trail was originally on the list of projects to be financed with the revenue from the proposed penny sales tax proposal on November's ballot, but the project got bumped because it was not deemed a transportation, road or light rail project. On Saturday, I was promoting the Bicycle Bash at a nice event at SWFBUD member store Bicycle Outfitters in Seminole. Adam Beland's store was raising money for autism while having a swap meet, offering free BBQ, playing live music and watching the Tour de France. A nice crowd came, including John Sinibaldi of the St. Pete Bike Club, Gary Rossiter of SWAMP and Boston Bill of Boston Bill's Sunglasses. Unique bike -- White Ridley Compact frame; red water bottle holders, red lettering, Bontrager rear wheel, Police Unity Tour seat bag, black handlebar tape. Be on the lookout, especially at south Tampa bike shops and other Tampa city bike stores such as Joe Haskins. I enjoyed working with Tampa Police Maj. John Newman, District 2 commander to deploy portable message board signs showing bike safety messages. This sign is on Central Avenue in Tampa and signs will be deployed around Tampa on roads that need them. As posted here earlier, SWFBUD has contacted police and local governments in Tampa Bay to ask them to deploy their portable message signs along roadways to display "Share the Road With Bicycles" messages. SWFBUD believes public education is an essential tool to enhance bicyclist safety on the roads. This morning, I got good news from the Pinellas County Sheriff's Office -- they are deploying three message signs with the Share the Road message at three locations. My name is lieutenant Adrian Arnold of the Pinellas County Sheriff’s Office. Pinellas County Sheriff's Office joins Hillsborough County Sheriff's Office, Tampa Police and Temple Terrace Police in deploying portable signs to display bike safety messages. 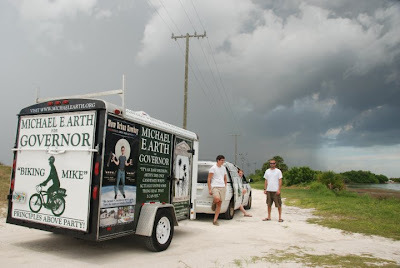 Mariella Smith is a diligent and committed environmentalist and bicyclist from south Hillsborough County trying to get a long paved trail built in south county. She's trying to get all six segments onto the MPO's long-range transportation plan for 2035. She wants all 6 segments of the South Coast Greenway multi-use paved trail to be on the funded projects list in the 25-year Plan (the "Cost Affordable" list in the MPO 2035 Long Range Transportation Plan). So far, only the first 2 segments are back onto the funded projects list, but now is the time to request that the whole thing be built in the next 25 years. The MPO board must get this message from MANY of us, in order to move them to do anything about it. Friends have sent over some terrific bicycle stories and I'm sharing those with you. 83 Degrees, a local online magazine in Tampa, offered two bike stories this week, including one that includes some of my thoughts on cycling in the region. The other story is about the Tampa Bay Bike Co-op. My friend Lorraine in the Denver area sent a story dealing with some bike controversies in Colorado. And Tammy in metro Tampa sent an interesting story about bicycling and a coffee shop in New York City. This morning I had a great conversation about bicycling and the Bicycle Bash with coffee roasters Dave and Susan Ward, who own Buddy Brew Coffee at 2020 Kennedy Ave. in Tampa. I'm happy to report that Dave and Susan told me today that Buddy Brew Coffee will be a vendor at the 2010 Bicycle Bash Classic, Presented by Cure on Wheels on NOV 7. Look forward to tasty java at the Bicycle Bash! They join American Classic, Boston Bill Sunglasses and Boomer Bents and Bikes as the first vendors to sign up. 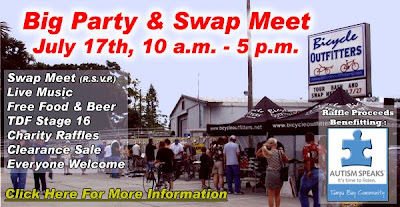 If you want to be a vendor at the Bicycle Bash, contact alansnel@yahoo.com. After a HART bus nearly struck me in January and clearly violated the law requiring that motorists pass bicyclists by a minimum space of at least three feet, SWFBUD went into action. I attended several HART board meetings and instructed the HART officials to start a public campaign educating the public about the three-foot buffer law. After I worked with HART's Katharine Eagan during the past few months, they came up with this sign that's appearing in buses. This is Luis Rivera, HART's operations superintendent, holding the sign today. This is a good example of taking a negative bicycle incident and turning it into a positive educational experience created by SWFBUD to hopefully educate the public about giving at least three feet when passing bicyclists in a car. Tampa Bay is taking in the Tour de France with bike rides and parties. Last weekend, Just Ride Bicycles had a ride and snacks at David Luppino's store in Riverview. Last night, Doug and Doreen Jesseph of the Seminole Heights Bicycle Club had a Tour de France party at their Seminole Heights house. And this morning, Carrollwood Bicycle Emporium staged two rides -- a 27-miler and a 44-miler, which went from Carrollwood to Safety Harbor and back. Back at the store, CBE hosted a fun spread of food and had the Tour on TV. Before the ride, I'm flanked by Brian Eckman, owner of CBE, and his store manager, Manny Sierra. We're wearing three different CBE jerseys for the Tour de CBE this morning. Jack "The Ghostrider" Sweeney and Doug "The Professor" Jesseph prepare fo the ride. Once back at the store, riders munched on snacks and watched the Tour. We watched Versus interview Lance, who crashed THREE times and has dropped nearly a whopping 14 mnutes behind the leader. This is no way for Lance to go out. Unfortunately, Lance is toast at this point in the Tour. Growing bicycling in Tampa Bay means working together with others who value and appreciate cycling as a great way of life, a way to stay healthy and a way to build stronger and more vibrant communities. This morning, SWFBUD visited Hillsborough County Commissioner Mark Sharpe at Buddy Brew coffeehouse on Kennedy Avenue in Tampa this morning. There, I met Dave Ward, who owns Buddy Brew with his wife (pictured left), Commissioner Sharpe and Carrollwood Bicycle Emporium owner Brian Eckman with his wife, Jackie, standing next to me at the end. Commissioner Sharpe is a great supporter of bicycling in Tampa Bay and won a SWFBUDDY Award at last year's Bicycle Bash for his political backing of bicycling. Sharpe invited everyone to the 2010 Bicycle Bash Classic, Presented by Cure on Wheels in this video. Stolen carbon road bike -- be on the lookout. 26" mens Fuji black with "fuji" in gray letters; carbon road bike. Owner Peco called University Bicycle Center and asked them to look out. All bike clubs: watch out for the bike for sale or trade or on the road. If sighted, call TPD at 231-6130 (non emergency dispatch). All nine SWFBUD bicycle stores are owned by people who add so much to the local bicycle scene. They give back a lot in many ways. On July 17, Adam Beland at Bicycle Outfitters in Seminole right on the Pinellas Trail is holding a terrific event. It's a customer-appreciation/swap meet/cycling celebration day with swap meet fees of $10 going to the Autism Speaks charity. Admission is free and the festivities will run from 10 am to 5 pm. The first 75 people get a free waterbottle. The swap meet will run from 11 am to 3 pm and live music kicks off at 12 noon, with face paitning from 12 noon to 2 pm. There will be a big raffle be held at 3 p.m., with all proceeds benefitting the Autism Speaks charity. There will also be a huge assortment of bikes and accessories at clearance prices, up to 70% off, with portions of those sales also going to support Autism Speaks. A few weeks ago Ivan, owner of Viitals healthy bakery on Florida Avenue, contacted me to see if I could help him get a bike rack. They cost about $300 and he couldn't afford one. So Ivan contacted SWFBUD for help. I got in contact with Karen Kress at the Tampa Downtown Partnership, who is friends with a school program that makes bike racks. They fashioned a bike rack and dropped it off at Ivan's bakery about a week or two ago. Ivan is happy with the new bike rack. A bicyclist riding a bike with a second person on the handlebars is stupid -- and can kill someone. Like the pedestrian struck by two people on a bike on a bridge in Clearwater. It's raining all day around here, so I'm not into riding the bicycle. So, I'll offer you a small buffet of bike links instead. Here's a fun message from Snoop Dogg wishing Lance Armstrong good luck at the Tour de France. From Snoop Dogg to Mia Berk. Mia Berk is a former Portland city bicycle coordinator who has seen Portland become America's premier bicycle city. A national bicycle route system is coming. It seems like every big city has debates about bicycle lanes. Even New York, which has improved greatly in the past few years. Some heavy hitters enter a bike lane debate in Brooklyn. Bait bicycles are used as bikes with GPS chips to track down bicycle thieves. Interesting story on the bait bike topic. What a wild and wooly First Stage of the Tour de France Monday -- crashes galore with everything from dogs to a massive pile-up a half-mile from the finish line. Farrar walked to the finish line. The New York Times offered a nice summary of the Tour de France's crash-laden events. Stay safe if you go out and bike today. The roads will probably be wet. To celebrate Independence Day, about 45 bicyclists pedaled the Independence from Oil Day" Bike Ride down Bayshore Blvd in Tampa vefore the rains soaked Tampa. Before the cyclists left Curtis Hixon Waterfront Park in downtown Tampa, about 20 bicyclists gathered at Hillsborough High School on Central Avenue in Seminole Heights to bike to meet the rest of the bike crowd. Bridget zips down the bike lane on Tampa Street. A Bay News 9 reporter interviews Margaret Shepherd of the Seminole Heights Bicycle Club at Curtis Hixon Waterfront Park. Bill and Doug of the SHBC gather for the ride. Neil Johnson of the Tampa Tribune interviews Dale Edminster of the Seminole Heights Bicycle Club. A classic Bell -- the helmet, not the person. Leaving the downtown waterfront park. Most bicyclists talk about making bicycling more popular and getting people on bikes. Jose Menendez doesn't just talk. He does. You first see Jose from about a quarter-mile away, wearing his trademark green reflective vest both night and day. Once he pulls up on his bicycle, you see a stocky man in long pants no matter how hot the weather. A light is secured atop his helmet. And his bike is a humble hybrid-style vehicle with red blinkers attached on the back. Jose volunteers for all bike advocacy events to spread the good word about bicycling and pedals in just about every advocacy bike ride. Jose is full of bike ideas and his latest was having a bike ride on the Fourth of July, calling it the "Independence From Oil" Bike Ride. He carefully plotted two bike routes -- one about 11 miles down Bayshore to Ballast Point and another 24 miles across the Gandy Bridge and back. Both rides start and end at the Curtis Hixon Waterfront Park. The rides start 8 AM Sunday. Jose also wrote up his own press release for the ride and spread the word. Jose also got help. Doreen of the Seminole Heights Bicycle Club got her graphics designer to produce a great flier. And other people spread the word about the Ride on blogs and web sites and Facebook. And Linda Saul-Sena -- in one of her last acts as city councilwoman -- got a city council commendation for Independence From Oil Day. I picked up the plaque at city hall and presented it to Jose this morning after the Seminole Heights Bicycle Club short ride. Jose is a great example for all bicyclists. 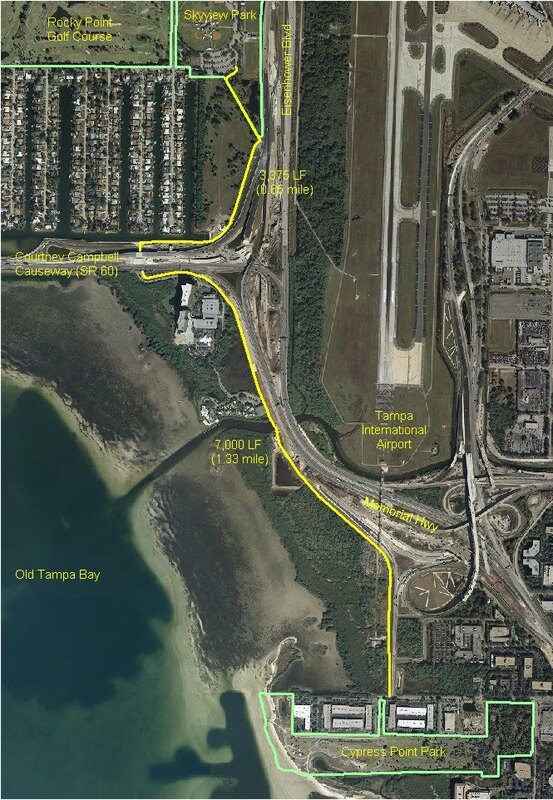 Karla Price of the city of Tampa reports that the trail connecting Cypress Street with the Courtney Campbell Causeway and then Skyway Park is officially open. The Florida Department of Transportation will be maintaining the trail until the agreement with the City of Tampa is executed. FDOT refers to it as the U-Path. The section from Cypress Street to the Causeway is approximately 1.33 miles long and from the Causeway to Skyway Park is .65 mile. A few weeks after I wrote about the incident regarding a Pasco County motorist threatening bicyclists with a gun outside San Antonio, the Tampa Tribune ran this story today. Looks like there's a bicycling candidate for governor -- Mike E. Arth.